Planners have long recognized what they call a “demographic shift” in areas near new or expanded airports and highways: in the years after construction of the new noise source, some proportion of nearby residents move away, seeking a return of the quiet they desire. Since about half the population is very noise tolerant, buyers who don’t mind the moderate noise are usually found. Sometimes homes must sell at a discount, and in other cases, the price isn’t significantly affected; rarely, homes with especially severe noise exposures cannot find a buyer at all. An article in South Coast Today gives a sense of how this is playing out in Falmouth and Fairhaven, where dozens of families within a half mile or so of turbines have been struggling with noise. As is often the case, the takeaways are ambiguous. 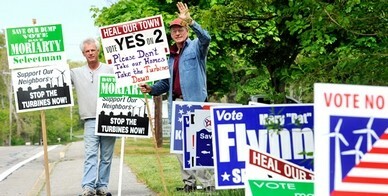 Two residents near the Fairhaven turbines are quoted, both of whom are reluctantly moving from their homes. One, who’s been sleeping in his living room because the noise in the bedroom keeps him awake, has found a buyer who’s paying just 7% below his asking price. The other, whose kids and their mom have already moved away because their 8-year old was having trouble sleeping, had his house on the market at a low-end price, and after “watching buyers come by, look at the turbines and drive away” for several months, he’s now hoping to find renters. 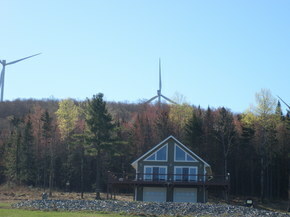 Likewise, a local realtor speaks of a house around a half mile from the turbines that’s been on the market for two years: “They ask about the noise, they ask about the flicker, and then they don’t put in an offer,” she says, noting that the asking price has dropped from $389,000 to $244,900. In Falmouth, realtors speak about similar troubles finding buyers, with some homes being passed from realtor to realtor as they attempt to sell. However, the director of Falmouth’s Assessor’s Office says that homes near the turbines have sold at “close to or more than” the assessed value. At the end of last year, a couple that was one of the closest neighbors to the one privately-owned turbine in Falmouth abandoned the home they designed and built, and started over with a cheap fixer-upper; I have not heard whether it has been sold or not. In the first town-wide vote on the question of what to do about noise issues around two town-owned turbines, Falmouth voters overwhelmingly defeated a measure that would have authorized the Selectmen to continue on their preferred path of dismantling the turbines. The proposal carried a likely pricetag of about $800 per household, spread over ten years, largely to pay back loans and renewable energy credits that the town received in advance in order to buy and install the turbines. The measure fell by a 2-1 margin, with about 40% of the town’s registered voters turning out. Board of Selectmen Chairman Kevin Murphy said that the board will now begin looking at other ways to try to address the long-simmering dispute. About 40 households have formally filed complaints, representing 15-20% of the homes within about a half mile. Since noise monitoring showed some violations of state noise limits, the two turbines do not run at night, so operate at a loss to the town, though they still produce carbon-free electricity for use at the town’s wastewater treatment plant. For more on the Falmouth vote, see coverage in the Cape Cod Times and from the AP. UPDATE, 5/25/13: Three neighbors respond to the vote in this local article. UPDATE, 6/5/13: Neighbors emphasize that the vote was about funding the previous decision of the Selectmen to take the turbines down (not about whether the turbines should operate), and that the problems will need to be addressed by the incoming Board of Selectmen and/or the Board of Health. They also say the state should step up with some financial help or forgiveness to lessen the burden on town taxpayers. UPDATE, 7/5/13: The Board of Selectmen have begun discussing their options for resolving the turbine issue. See local coverage of their first public discussion here and here. As in Falmouth, where violations were also found in only some conditions and just over the limits, dozens of neighbors are complaining of lost sleep and other related health issues. EPA standards developed in the 1970’s suggested that noise sources are fairly well tolerated when they remain within 5dB of existing ambient levels, and that at 10dB above ambient, “widespread complaints” are likely. The detailed results from Fairhaven were not released, but the Falmouth report showed all locations exceeding 5dB, and most exceeding 7dB. Some states still use 5-6dB thresholds, though many have moved to the 10dB used in Massachusetts, or refrain from the difficult task of regulating noise based on ambient conditions. The Massachusetts measurement protocol has elements that may in part compensate for the larger 10dB threshold, and other elements that could counter that compensation: the standard compares the L90 sound level (quietest times) of ambient conditions with the absolute peak sound levels of noise from the turbines, rather than the average of each, which may somewhat increase the dB difference; however, the use of “slow” five-second time averaging, rather than “fast” one-second samples (closer to how the human ear perceives sound) likely results in lower peak measurements. Again, though, quibbling over exactly how the measurements take place can obscure the larger issue, which is that current standards appear to be insufficient to keep complaints to a minimum. The three large wind farms currently operating in Vermont have spurred enough noise complaints to trigger an investigation by the state Department of Public Service. DPS Commissioner Chris Recchia said “I want to get to the bottom of this….It’s not what was expected.” Recchia suggested that he’s considering asking the Public Service Board to reconsider their existing noise standards. Since last fall, 105 formal complaints have been filed, by 23 different individuals living near the Sheffield, Lowell, or Georgia Mountain wind projects. Annette Smith of Vermonters for a Clean Environment is also collecting confidential complaints, some from people who have filed formal complaints, and some from neighbors who have felt it to be futile to complain to the turbine operators and/or state. The DPS is hiring a noise expert to analyze the complaints, and comparing them to quarterly noise measurements made near each wind project. After this analysis, the DPS has three options, and could recommend one or more: enforce standards if they find violations, create a more effective system for operators to respond to complaints, or ask the PSB to change the noise standards if necessary. See this recent local news article for more, including details of a recent bad night for neighbor Kevin McGrath, whose house is pictured above.